Do you ever feel like you’re living in survival mode? You look around and have to triage everything because there’s just so much to do. Dishes, laundry, baths, dinner, lunches, breakfast, school projects, homework…the list really goes on and on. But what if there was a way that you could get out of that cycle? Because let’s be honest, if you feel like you are drowning every time you get home, you do not have the time or energy to focus on what really matters. If every night is a mad dash of dinner, baths, and bed, you’re not nurturing hearts with family devotional time, scripture memory, or teaching your kids to pray. If every morning is a scavenger hunt for clean socks, clean cups, and missing lunch boxes, you’re not starting the day with a heart focused on how to serve others or becoming more like Jesus. Her home is now a calm and laundry free place where she gets to spend the weekend enjoying her kids instead of catching up on housework. 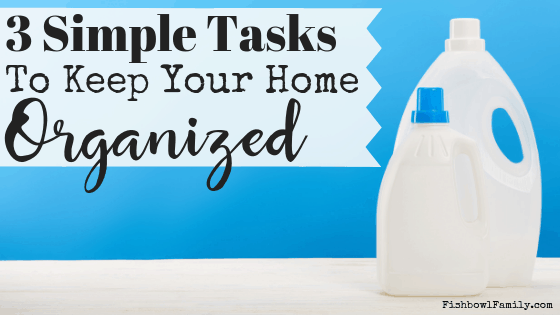 This post, Three Simple Daily Tasks to Keep Your Home Organized, contains affiliate links for your convenience. This means that if you make a purchase using our links, we’ll receive compensation at no additional cost to you. Read our full disclosure policy. So without further ado, here’s Nichole. It’s nearly midnight, and I’m a hot mess writing about how I keep from being more of a hot mess. Basically, I’m runnin’ on good ol’ “mom fumes” AKA coffee and hope that tomorrow (Saturday) brings me a bit of peace. I’m a small town Arkansas momma, recovering nomad, and my hubs and I have three kiddos (Sawyer 7, Sutton 5, and Shep 3). I am a full-time Speech Language Pathologist, I tutor two nights a week, I”m volunteering most Sundays at church in the nursery or making coffee and have just begun helping other mommas declutter and hop on the MINIMALISM train! CHOO CHOO! Bye clutter. We won’t miss you girl. Every Saturday morning, I am helping a sweet momma frand organize rooms in her home to give her more peace, simplicity, and structure by letting go of STUFF that no longer serves a purpose for them and making a designated space for what remains. It has been so rewarding because girl, I was there. Like, in the pit of crazy. I used to live in the whirlwind of our nutty schedule (my husband travels a LOT) and was drowning in unfolded laundry, dishes to be put up, tiny pieces of toys everywhere testing my fruits of the spirit. It’s all funny and lighthearted until you are crying in your closet wanting to run away from the chaos that is your home. I cried in my closet a lot. Okay, so I just cried a lot. Life was overwhelming because the season was hard, but I couldn’t accept the mother I had turned into. I wasn’t joyful, playful, energetic, creative, self-motivated, many of the traits I longed for our kiddos to become. I had to make some changes for our family. 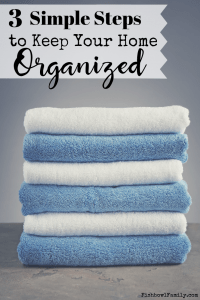 I wanted to share three simple but necessary things I do every day to help keep our home organized and keep my crazy at bay-ish. Not wash and leave it in the dry for a week. I wash, dry, fold, AND PUT UP one load every day. I have NOTHING in my laundry basket tonight after a 12 hour work day, two birthday parties until 8:30 pm, and evaluation writing until 11:30 pm. I don’t want to catch up on laundry this weekend. I want to soak up family time. Here’s show my laundry habit works for me. Every night after my kiddos baths, I begin my load from the day. I move it over when they start heading to bed. I fold it and put it up once they are asleep. I have really great sound machines, so my kids don’t wake up while I sneak around putting away their clothes. This takes me no time. There’s no dread over 3000404050500040 pieces of laundry anymore. Side Note: My favorite laundry detergent is Young Living’s Thieves Laundry Soap. I make all of the stuff for our lunches for the week on Sunday. I use Hawaiian rolls for turkey or pepperoni sandwiches. I buy individual applesauce, yogurt, baggies of chips, crackers, ranch packets, and water bottles. I cut up all our fruits and veggies. Everything is placed in the bottom drawer of the fridge. Each afternoon as we walk in from school, I empty out all three lunch boxes, replace them with items from the drawer, and put the lunches back in the first drawer. This saves me thought, time, and money. Side note: Our favorite healthy supplement for our family is Juice Plus gummies. I don’t sell these, they’re just so good. All four beds are made before we leave our home. This is a non-negotiable for this momma. All of you laid back chill mommas, you do you, boo. The Morrow family is making their beds, end of story. We make our beds as soon as we get up. We may have marker on the wall and our toddler running around with a broom trying to hit the dog and his sisters, but our rooms always look fairly TIDY because our beds are MADE! I grew up with a military family who always kept a tidy home. This step is something my momma instilled in me, and I’m passing it on to our kiddos. Basic lesson: Take care of what you have. This exudes a spirit of gratitude. What we do with the small things indicates what we’ll do when we’re given big things. Side note: I was our sheets every week, too. Comforters once a month. I wish I could say that life is simple and peaceful now that we are organized and disciplined. I can say that I’m crying less, unexpected visitors can pop in at any moment and our home will always be presentable, and I am most DEF not found under piles of laundry anymore. As our family grows and changes, our needs will too. We will re-assess what works for us and keeps us enjoying this sweet life God has so sweetly gifted us. For now, these three simple changes have saved us a ton of time and tears. I hope it helps you too, momma. And hey girl, you’re doing a wonderful job. If you are throwing a Lunchable in your kid’s backpack at 7:30 am, looking at laundry piled to the ceiling in your master bedroom, AKA the laundry room, and haven’t made your bed since you MIL last visited, you’re still doing a wonderful job. *This is where I should say a huge thank you to my friend Jenna Ruhe and her momma, Laurie Malloy, who shifted my thinking and sparked an interest in minimalism in my soul. Their work at Simple Spaces is motivational and beautiful and functional. It’ll never forget these three bonus tips from them: 1. Store toys in cute baskets or ottomans that are simply a part of your home’s decor. 2. Use clear containers in the attic and garage so you can see the contents. 3. Be home in the evening when your husband and kiddos come home. Have the lights on and dinner started (or bought). Make your home warm and cozy and comfortable. They won’t forget that. What daily habits have you found to help you keep your home organized? Tell us in the comments!